Eileen Kishman received her physical therapy degree from the University of Michigan – Flint and has over 32 years of experience as a licensed Physical Therapist. She has a special interest in women’s and men’s pelvic health issues, breast cancer/ lymphedema patients, and pregnant and post-partum patients. 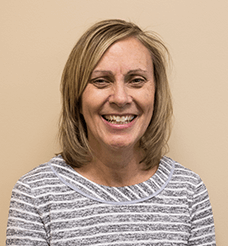 Eileen is certified in MLD (lymphedema treatment), she is a prenatal exercise instructor, and has completed training in dry needling and McKenzie treatment and diagnosis of the spine. In her free time, Eileen enjoys running, watching her daughter swim, and coaching.